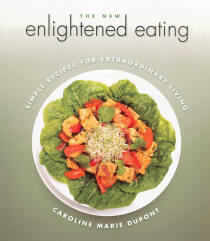 The New Enlightened Eating by Caroline Marie Dupont is a very interesting cook book that is filled with many healthful living recommendation and may recipe suggestion. Caroline says that she has revised many of the recipes in this edition to make them more healthful, such us using less salt, fats and oils, and people who are on a low salt or fat diet can even reduce them further. The New Enlightened Eating has many international and North American recipes for every meal of the day including breakfast dishes, quick breads, beverages, dips, spreads, soups, salads, sauces, dressings, main and side dishes, desserts, and snacks. There are even sections on how to cook and what to have on hand in your kitchen.